Attorney Daniel E. Casagrande is the “Giant Slayer” among Connecticut counsel—a designation bestowed by the Connecticut Law Tribune for his high-profile Municipal Law work on behalf of towns and cities, notably in tax appeal cases. A highly-experienced attorney in private practice in Connecticut since 1986, who also focuses on Planning & Zoning Land Use and Land Use & Environmental Law, Attorney Casagrande has been retained to represent Connecticut municipalities and land use agencies in specialized assignments such as charter revisions, affordable housing appeals, construction projects and disputes. Attorney Casagrande’s municipal work has also included drafting public works construction contracts and redevelopment contracts, land use appeals, construction claims, takings disputes, condemnations, assessment appeals, and tax foreclosures. He has served as an outside Assistant Corporation Counsel for the City of Danbury from 1990 through the present, and has served multiple-year engagements as Town Attorney for New Milford and New Fairfield. 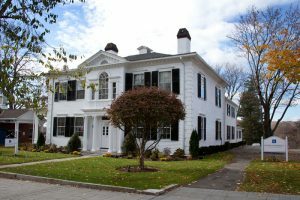 Additionally, Attorney Casagrande has been retained for special counsel assignments on behalf of Ridgefield, Middlebury, Southbury, New Milford, Waterford, Cheshire, Bethany, Beacon Falls, and the City of Waterbury, for which he handled a complex and “historic change” in municipal government. One signature example of Attorney Casagrande’s work is the 1998 Union Carbide appeal of the municipal tax assessment valuation of its Danbury, Conn., headquarters, equating to a $307 million market value. As outside Assistant Corporation Counsel, Attorney Casagrande represented the City of Danbury. The trial court upheld the City’s valuation after a 24-day trial, Union Carbide appealed, and Attorney Casagrande ultimately prevailed before the Connecticut Supreme Court, safeguarding $10 million in tax revenue for the City. The Town of Waterford subsequently retained Attorney Casagrande when Dominion Nuclear Connecticut, Inc., owner of the Millstone Nuclear Power Station, appealed the town assessor’s $1.2 billion valuation of Millstone for tax purposes. After a four-year battle and a 24-day bench trial, the court preserved 93 percent of the town’s valuation in what is believed to be the largest assessment appeal litigated in Connecticut. When Danbury was sued over landfill odors by 350 plaintiffs in Bethel, who hired attorneys affiliated with the firm made famous in “Erin Brockovich” and demanded $120 million, Attorney Casagrande secured a settlement of $3.5 million, with all but $900,000 paid by the City’s insurers. In the mid-1990s, a major developer was allowed to begin site work for high-end condos on municipal redevelopment property in Danbury before obtaining title or financing. After making $7 million in improvements, the developer couldn’t get financing. The City terminated the redevelopment contract and legal action ensued. In the end, an arbitration panel awarded the developer $0. Most recently on behalf of clients, Attorney Casagrande appealed Connecticut Siting Council approval of a large energy project over the objections of citizens, officials and even state agencies. This project calls for destruction of 87 acres of valuable core forestland on Candlewood Mountain in New Milford to make way for a 20 MW solar energy facility generating electricity to be sold to utilities in Massachusetts and Rhode Island. Attorney Casagrande once defended a defamation claim brought by a real estate developer who alleged the defendant defamed him in a YouTube video when he criticized affordable housing projects pending before a land use commission. These actions have become known as SLAPP suits—Strategic Lawsuits Against Public Participation. The trial court granted summary judgment for Attorney Casagrande’s client and ruled the statements in the video were not defamatory as a matter of law, and were protected by the First Amendment’s Fair Comment Doctrine. An ex-officio member of the Connecticut Association of Municipal Attorneys board, Attorney Casagrande served as CAMA president of from 2011 to 2013. He has given numerous presentations at both the state and national levels on legal issues facing municipalities, including land use, tax appeals, Freedom of Information (FOI), and trials of complex valuation cases.